All-new G3 Guide™ Jacket is 25 percent lighter, while ratcheting performance thanks to rugged, rip-stopping 3-layer GORE-TEX® Shell fabric. Guide-tested including 2 large top-loaded fly boxes pockets and zippered chest, internal stash, and micro fleece-lined hand-warmer pockets. The stowable 3-point Storm Hood adjusts to fight the fiercest downpour. And proven Dry Cuffs™ keep water out of the sleeves when tailing, and releasing, fish. The redesigned Guide™ Jacket is built-to-fish with Gore-Tex® Shell fabric that's waterproof, breathable, lightweight, and tenacious against tears. Guide-tested features include two top-loading, fly-box compatible storage pockets with integrated retractors and Shingle Cuff™ engineering for unimpeded casting. A Tuck-Away fly patch folds out to hold sidelined bugs. 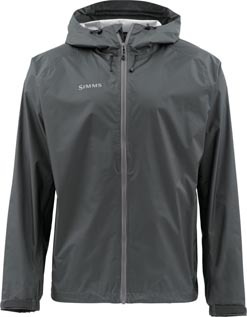 Simms' lightweight, highly breathable Riffle Jacket keeps anglers dry in a deluge thanks to 3-layer Toray® waterproof/breathable fabric. Clean architecture minimizes line catch points, while pass-through hand-warmer pockets relieve frozen fingers and allow access to waders that lie beneath. Two internal chest pockets add capacity for large fly boxes. And a water-resistant easy cinch Velcro® cuff closure system locks out moisture and wind for inspired performance, wherever you choose to dive in and stay dry. 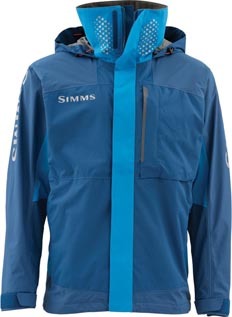 Perfectly packable waterproof/breathable storm jacket Simms' packable, waterproof 2.5–layer Waypoints® Jacket is determined to keep you dry. 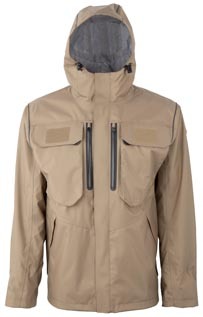 Details include an ultralight build, where the jacket stuffs into itself for convenient stowage via the left–hand pocket. Anti–catch molded cuffs eliminate line snags, and trusted YKK® VISLON® center–front zippers bring failsafe performance to this restless, on–the–go piece. 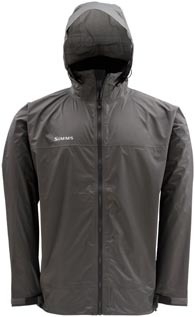 Simms' Challenger features 2-layer Toray® fabric with fully taped seams for 100-percent waterproof, breathable performance.. Revive cold hands in fleece-lined pockets and dodge hard rain by ducking inside a 3-point adjustable storm hood that conveniently stows in the collar. External architecture includes a YKK® VISLON® center front zipper with a storm flap for added protection. Finally, a dual draw-cord adjustable bottom hem customizes fit, while dual kill-switch anchor points add on-the-water safety. The Aesis Shell Jacket is made with 3-layer waterproof and windproof V-TecH™ breathable fabric and is designed with a triple water-shedding rain fly on the front zipper and fully taped seams. The integrated wire brim hood incorporates a 3-way adjustment to seal out rain from entering where the jacket meets your face and maintains your peripheral vision. Water tight cinch cuffs also eliminate water from running down your sleeve when casting. Large low profile chest pockets are perfect for storing fly boxes or gear, and there are numerous interior and exterior pockets. A removable magnetic patch on the chest is perfect for quick fly or hook storage when changing flies. Both front and rear D-rings allow for accessory attachment. 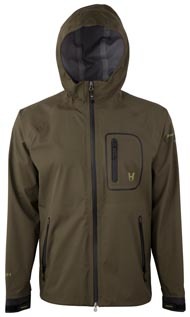 You never know when you'll get stuck in the next downpour, but you'll know you are prepared for it with the Hodgman Aesis Sonic WadeLite shell jacket. Designed with the breathable V-TecH™ lightweight ripstop fabric for the perfect blend of durability and airy weight. This jacket utilizes Sonic 2.0 technology, which creates a double sonic weld seam and eliminates thousands of stitch holes in the fabric, ensuring water stays on the outside of your jacket where it belongs. The vented design and laser cut underarm perforations enhance breathability, while the fully taped seams seal out rain. 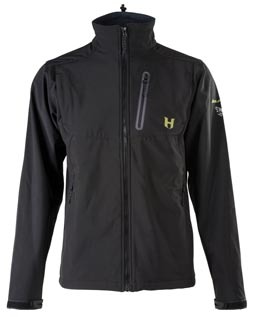 The evolution of the soft shell continues with the Hodgman® Aesis Soft Shell Jacket. Your new favorite piece of gear is designed for year-round use with its windproof fleece-lined water-shedding soft shell fabric for use on chilly mornings or cold winter days. High water hand warmer pockets allow you to keep your hands toasty even when the jacket is worn inside waders. You can even snap the jacket to a belt keep the jacket in place when pulling on waders. Versatility is key, which is why the Aesis Soft Shell Jacket includes two zippered lower hand pockets and a chest zippered pocket, offering a range of storage options.